JAMAICA, Vt. — One bright fall afternoon, I was tooling around the back roads of Vermont in my battered minivan, windows down, radio on, chatting with my pal Julia about my travels in Turkey, and love of all things Turkish. I expect the Vermont landscape to offer up pristine beauty, white clapboard churches with pointy spires, and the occasional field where cows graze in picturesque splendor, but nothing unusual. The road fit my stereotypical image completely. What could possibly be so interesting? The road rose and dipped, and there it was. I braked and blinked at a small stone chapel. It was so familiar, so out of context. The last time I gazed at this silhouette I was standing on a mountain in Turkey, not far from the ancient city of Ephesus. Meryem Ana Evi, the House of the Virgin, is believed to be the last residence of the Virgin Mary and is a sacred pilgrimage site for Christians and Muslims. Here was its mirror image, replicated stone for stone, on this verdant hillside. The story of the Vermont chapel can’t possibly compete with the Turkish version, which involves a 19th-century invalid German nun, feverish visions, the stigmata, a French clergyman, and two popes, not to mention Mary, the mother of Jesus, but it’s a tale worth telling nonetheless. “It’s an amazing story, the way it came together,’’ said Mary Tarinelli, when we spoke by phone. Tarinelli’s parents were both from Vermont. In the 1950s, her dad was stationed in Athens with the Air Force. During this time, a modern road was built to Meryem Ana Evi and her dad went to take a look. “Father said that being up on the mountain reminded him of Vermont,’’ said Tarinelli. 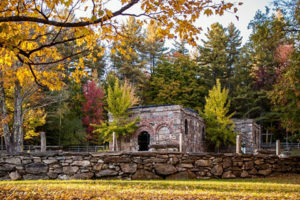 Thus began a connection between the Green Mountain State and western Anatolia, a link set in stone in 1994 when Tarinelli and her husband, Don, donated 82 acres of a 200-acre horse farm to establish Our Lady of Ephesus House of Prayer. Tarinelli hired Gregory Brown, a local mason, to construct the chapel using rocks from the property. But before the project began, she took him to see the original. Building commenced in 2000, and was completed in 2006. The result is remarkable. The footprint matches the Turkish original and the stones are set in identical patterns. There’s an entry foyer that leads to the main chapel where the altar nestles within a curved apse, and a wing to the right that is said — in the original — to have been Mary’s bedroom. The Archbishop Emeritus of Izmir, Giuseppe Bernardini, has visited and blessed the newer structure. The chapel is only one part of the House of Prayer complex. Follow the road up a steep, winding hill, past an open pasture with a towering crucifix, to a large contemporary structure with two chapels on the main floor. Downstairs, eight monastic accommodations are available near where Stations of the Cross, carved in wood, hang on former horse stables. Travelers unable to make the long journey to Turkey might consider a road trip to Vermont. There’s no sacred spring with healing powers nearby, and no claims have been made about the lame walking or the blind regaining sight. On the other hand, there are no crowds here. There’s no ticket booth, no gift shop selling icons, and no vendors hawking postcards and guidebooks. And when you arrive, if you close your eyes and open them quickly, you might for the briefest moment be transported to the mountains of Turkey. That’s miraculous enough for me. Free. Offers eight monastic accommodations. Linens and towels are provided, and a small kitchen is available to prepare meals. Minimum donation: $35 per person per night.